Invisible Conspiracy Dooms "An American Carol"
It&apos;s always a conspiracy with them. No, I&apos;m not talking about the secret plot by George Soros and Warren Buffet to destroy the U.S. economy with the aid of communists, nonprofit groups, the mainstream media and voodoo priests in order to elect Barack Obama. Oh crap, said too much. No, I&apos;m talking about the fact that the right-wing "comedy" American Carol got absolutely crushed at the box office this weekend and that conservatives are not blaming a movie that&apos;s got a whopping 15% on Rotten Tomatoes (by comparison Beverly Hills Chihuahua has a 42% rating) for the failure. No. It&apos;s the liberal movie theater owner conspiracy. Even worse, the creators of the movie are fanning the flames over this. You hear the same thing when right-wingers write their latest conservative book club bulk-buying boosted diatribe and then complain about those liberal book store employees doing all sorts of dastardly deeds like hiding their stupid books. I&apos;m a chronic book store patron and it never fails that the latest right-wing screed gets prominent placement at the front of the store in such conservative enclaves as Harvard Square or Dupont Circle. The invisible hand of the free market has decided, and like the billionaires on Wall Street begging for a bailout it seems conservatives are not real high on the free market in actual practice. RELATED: Oliver Stone&apos;s "W" is not going to be a fair movie. It is preaching to the converted like me. 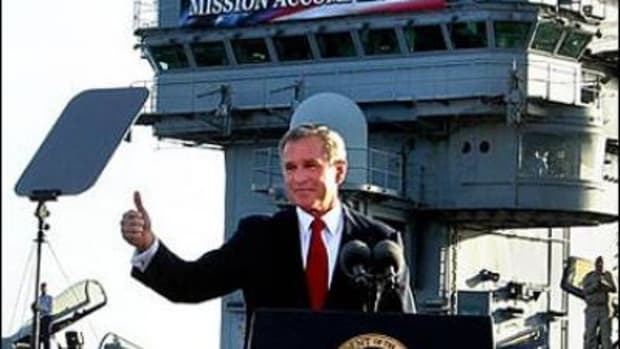 I would like to see a straightforward movie done on the Bush presidency (and Clinton as well) but the trailer looks funny and I&apos;m probably gonna go see it anyway. On the other hand Frost/Nixon looks really good.